If you trust the people you work with, you can be open and honest in your thoughts and actions, and you don't have to waste time and energy "watching your back." 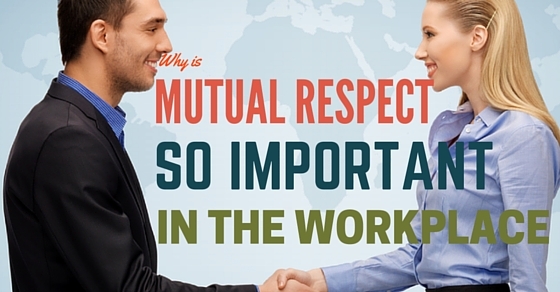 Mutual Respect – When you respect the people who you work with, you value their input and ideas, and they value yours. In a study of 20,000 people across industries and organizations I’ve found that the number one thing that people want from leaders is respect. Getting respect in the workplace will bring more meaning to the work you do, you will enjoy your job more, you will have opportunities to express yourself, you will be able to advance farther, lower work stress, and generally get along better with the people around you. If you hold a discussion, people will come up with many more ideas of behaviours that show respect. You will also find that cultural differences will effect what is considered respect. For example looking someone in the eye is considered showing respect in some cultures but disrespectful in others.